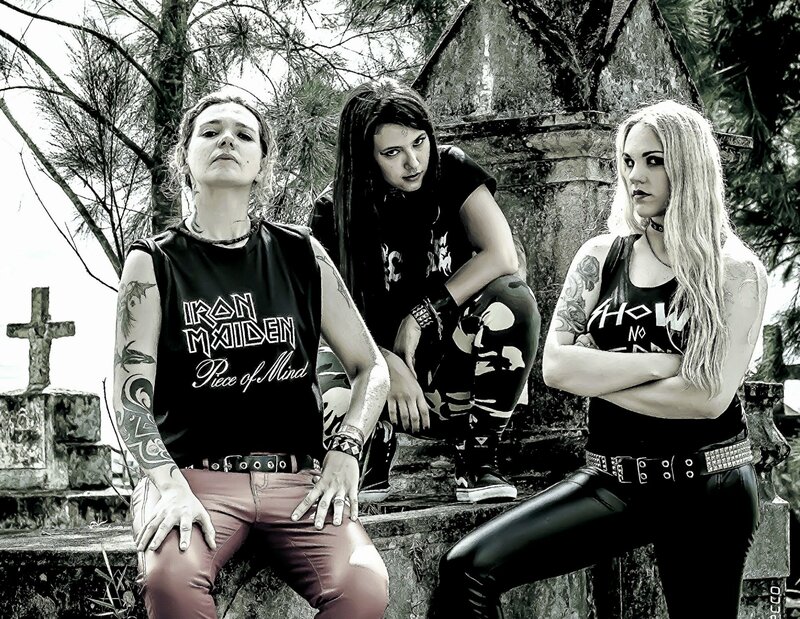 Brazilian trio Nervosa exploded into the mainstream metal consciousness with its self-distributed "2012" demo/EP, of which the YouTube success of the single 'Masked Betrayer' was instrumental in the band signing with Austrian label Napalm Records. The cooperation gave birth to the trio's highly publicized debut “Victim Of Yourself”. The band’s 2014 debut was the transitional effort between its early Fernanda Terra era, who contributed to the song arrangements for that session. “Agony” is the first album to feature input from drummer Pitchu Ferraz. Nervosa has been able to cement its position as one of the elite practitioners of the retro-thrash metal movement, but has yet to show any distinct character of its own. “Agony” is not so much an evolution from as it is a continuation of “Victim Of Yourself”. All songs are cut largely from the same cloth as the debut, only Lira’s vocals sound much deeper and serpentine. ‘Deception’ has semi-growled backing vocals by Prika Amaral. Amaral has improved as a lead guitarist as songs as ‘Failed System’ attest to. ‘Surrounded By Serpents’ is the most ambitious track of the album, in itself a lone highlight in a morass of similar sounding cuts. ‘CyberWar’ is a re-tread of ‘Masked Betrayer’ using a set of nearly identical riffs, vocal cadences and drumming patterns. ‘Hypocrisy’ starts out in a more death metal direction, but quickly regresses to typical Nervosa fodder. “Agony” conclusively proves that Fernanda Terra, who co-wrote the "Victim Of Yourself" album but was ousted prior to the studio recordings, was the superior drummer. Ferraz’ playing is low on captivating fills, rolls and interesting footwork. Drawing inspiration primarily from the classic Bay Area and Teutonic thrash metal institutions Nervosa is in no rush to carve out an identity of its own. Only on the limited edition bonus track ‘Wayfarer’ do the girls show variation in their songcraft. Fernanda Lira is not only a commendable singer, but her plucking Steve Harris (Iron Maiden) styled bass playing is often hardly given space to breath due to Amaral’s concrete riffing. Pitchu Ferraz is of the Bill Andrews (ex-Death, Massacre) school of drumming – and while she potentially has more tricks up her sleeve, they are not allowed to flourish here. Nervosa could produce some incredibly intense music if Lira and Ferraz were allowed more muscle in the compositions. “Agony” is testament to Amaral’s laser-vision of thrash metal, but none of its translates in memorable songs. The album is visceral, concrete, and devastating upon initial discovery, but “Victim Of Yourself” had more substance. Amaral’s insistence on a single guitar setup is what limits the trio’s songwriting. Unlike Krisiun, Nervosa is adamant in writing guitar lines that can be recreated in the live environment. If there’s one thing that Nervosa would benefit from, it would be a second guitarist, either in the studio or live. While each member has grown in leaps and bounds since “Victim Of Yourself” there’s no notable evolution to be found on “Agony”. Each of the tracks is leaner, more streamlined and tightly composed in comparison to the debut album, on which tracks tended to wander. 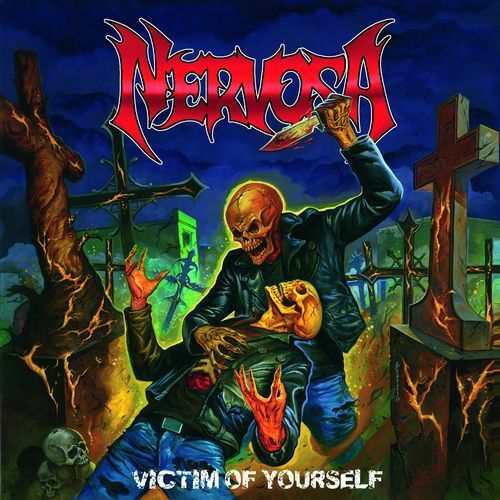 Alas, Nervosa has made no significant progress as songwriters, which is a pity. “Agony” is more of the same, but not necessarily better despite the improved production values and performances. The runaway success from “Victim Of Yourself” allowed the girls some considerable industry leverage for their second record. For this session Nervosa was allowed to record outside of its native Brazil, and they opted to cut the record in America. The drums were recorded at The Foundation Studio in Ashland, Oregon with Sylvia Massy producing. Vocals, lead/rhythm guitar and bass guitar were recorded at Norcal Studios in Davis, California with 2 time Grammy nominated engineer Brendan Duffey producing. The artwork was rendered by British graphic designer Godmachine. An Ed Repka canvas seems inevitable for the girls' third effort. In all “Agony” remains on the same creative plateau as “Victim Of Yourself”. Nervosa is content being a mere sum of its parts, and to not disturb the waters too much. At some point they want to start carving out their own sound. It remains to be seen how long they can keep churning out similar sounding albums. Those hoping to see Nervosa make a similar growth as Sepultura did on its early albums will be left on their hunger. Despite the lack of any significant progress “Agony” stands head and shoulders above the great majority of the retro thrash metal revival movement. Nervosa doesn’t profess to be anything that it’s not, and that is its biggest strength. 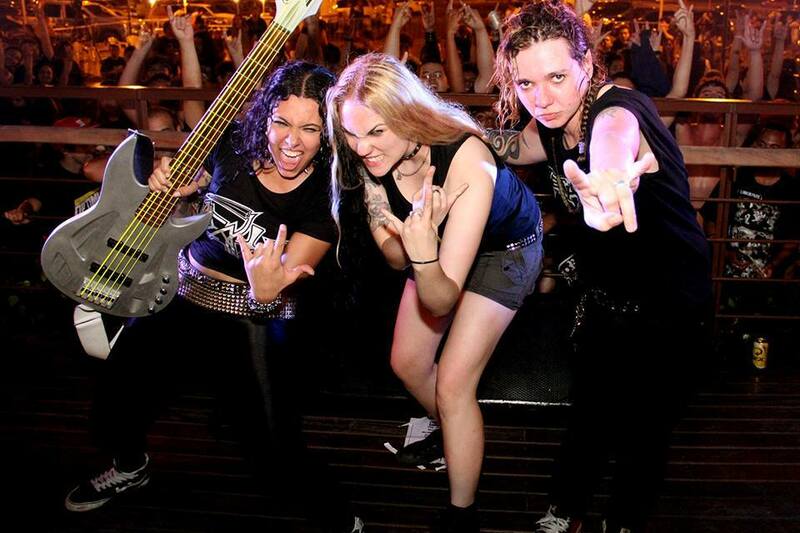 One of the more exciting additions of the retro-thrash metal pantheon must be Brazilian all-female power trio Nervosa. Coming to the world at large via Austrian label Napalm Records (a label that mostly specializes in gothic – and symfo metal) the trio combines several schools of American - and European thrash metal with the rabid intensity of traditional death metal. “Victim Of Yourself”, the band’s 2014 debut, is the culmination of a trend that started at least little of a decade prior with the release of Municipal Waste’s second album “Hazardous Mutation” in 2005. It is a clear sounding wake up call to both age-old veterans, and their many youthful imitators and copycats worldwide. “Victim Of Yourself” is sure of itself, in what it is and what it intents to do, and it is a reminder that musical merit and an understanding of the genre gets one farther than gimmickry and goofing off. Is the record good? You bet. Is it faultless? Hardly. The explosive popularity of retro-thrash itself can be explained by what was en vogue just a couple of years prior. In 2002-2003 technical death metal and the more abrasive forms of sludge – and math metal were everywhere. Technicality and complexity were the name of the game, and something had to give. It was time for something simpler, something with a more working class, blue-collar appeal that metalheads of various stripe could all agree on. Municipal Waste wrote the record that opened the proverbial floodgates, and British label imprint Earache Records functioned as the mecca for much of the resultant movement, and the genre’s revival in the subsequent boom. In fact Earache Records invested so heavily in the trend they themselves set that they did away with much of their artist roster to welcome the hungry young bands that flew the thrash metal flag, most prominently among these Evile – that other priority retro thrash band. 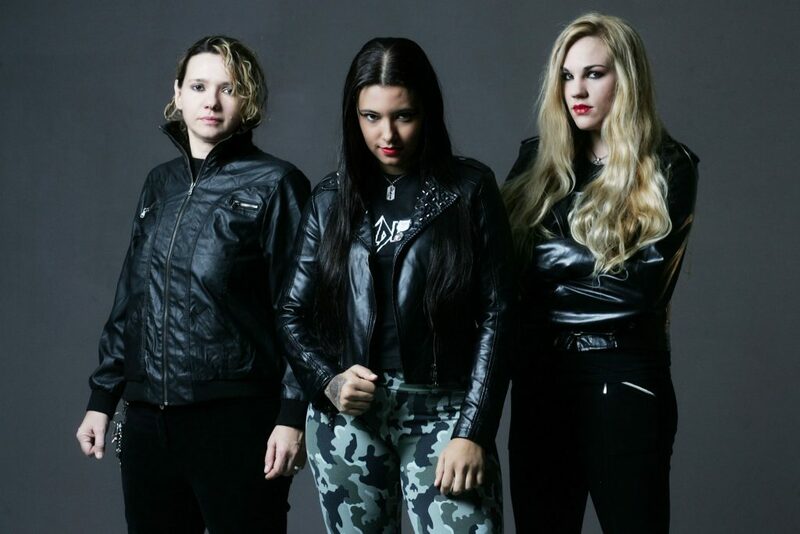 Nervosa is centered around the duo of founder/chief-songwriter Prika Amaral (lead guitar, backing vocals) and lively frontwoman Fernanda Lira (vocals, bass guitar). Before arriving at its current constellation Nervosa went through a number of members (two drummers, and a second guitarist) and independently released a three-track demo/EP. The promotional video for ‘Masked Betrayer’ became a runaway YouTube hit (20 thousand views in a week), which was instrumental in the trio being offered a recording contract with the Napalm Records label imprint for the full-length debut. The 2012 demo was recently re-issued with new artwork by the band’s current contractor under the name “Time Of Death” to capitalize on the rising interest in this Brazilian phenomenon. The band name itself is Portugese for ‘angry women’, and that seems fitting enough for the band, and the genre. Debuting, at least on a theoretical level, on this album is drummer Pitchu Ferraz (replacing Fernanda Terra who played on the demo/promo), who cut her teeth in a few regionally mostly-female forces before joining. The music itself taps from the well of Teutonic thrash (mostly in its choice of riffs) with the typical breakneck South American intensity and the head-on straightforwardness one often associates with Bay Area thrash metal. Notable is that Lira’s bass guitar lies prominently in the mix, and this combined with the overall level of energy often borders on early death metal circa Death’s seminal two records “Scream Bloody Gore” and “Leprosy”. The screams and rasps of Lira herself are very redolent of Destruction’s Schmier and Death’s own Chuck Schuldiner. Largely all these songs share a similar architecture and construction with each focusing on a different aspect of what makes the genre work. 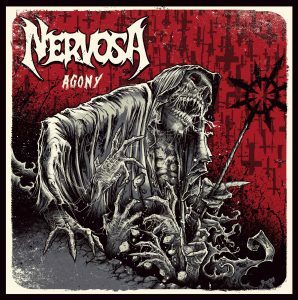 Nervosa also doesn’t shy away from slowing down the tempo, using melody or exciting leads and solos. Admittedly, Prika Amaral’s solos don’t nearly feature as prominently as they should/could, and a lot of the songs would stand out more with two (or more) lead breaks instead of the current single one they have. The rhythm sections tend to blend in as the record progresses, although the sheer level of intensity and enthusiasm the three girls muster does indeed put many of the band’s international competitors to shame. While admirable in its consistency it wears thin quick, and its abundant enthusiasm and energy aren’t enough to mask its more glaring blunders. ‘Death!’, the lead single for this record, is of course instantly recognizable with its playful bounciness during the verses, and ripping early death metal chugging during the chorus where both Lira and Amaral shriek the song title over and over again. As with the other tracks of the album the biting vocals, constant percussive propulsion and Amaral’s spirited solo’ing are the highlights. Much like their once-relevant country mates in Sepultura the girls deal with the socio-political and economic situation of their home country Brazil. Another headscratcher is ‘Uranio Em Nys’, which only truly thrashes during the gang shouted chorus, but otherwise is a two-minute late 90s death metal track that proves conclusively that these girls can take on the likes of Krisiun or Rebaelliun should they so desire. Right now the band doesn’t seem very interested in flexing its compositional muscle, as they are too busy thrashing out and having a good time. It will be interesting to see how Amaral’s writing grows in the years to come. Just like how it will be interesting to see what impact Ferraz will have on future material. “Victim Of Yourself” was recorded at MR. Som Studios with Marcello Pompeu (of legendary early Brazilian metal band Korzus) at the helm. While it is Pitchu Ferraz that currently sits behind the kit, it was in fact former drummer Fernanda Terra who sat in and wrote drums for the sessions. As of this writing it is hard to actually pinpoint how Pitchu Ferraz figures into it all. Much of the material was probably written when Fernanda Terra was still in the band, and Ferraz probably added her own touch to the patterns written by Terra. Ferraz seems capable enough on her own, yet on the next album will she truly show her merit. The artwork was rendered by the much in-demand Andrei Bouzikov, who has become somewhat of a modern day Ed Repka for the still incredibly popular retro-thrash movement. On the whole the album is a satisfactory, but samey sounding affair that would have benefitted tremendously from some trimming with extreme prejudice.